Enjoy the silence of Carlin Canyon, between rock walls once echoing with cacophony of wagons, animals and people. View the sparkling water as the North Fork of the Humboldt flows into the Humboldt River, once a scene of dust clouds rising from oxen, horses and wagons. Stand in the shade of tall cottonwood trees, at the edge of a meadow once containing Fort Halleck. Feel the breeze moving through the narrow South Fork Canyon as you imagine emigrant wagons exiting its confines. Feel their despair at learning of the time lost by using the Hasting’s Cutoff. Listen to the quiet sound of boiling water rising from Carlin Hot Springs next to a favorite emigrant camp site. This book follows the California Trail past trail intersections with the Secret Pass Trail, Hastings Cutoff and Greenhorn Cutoff. 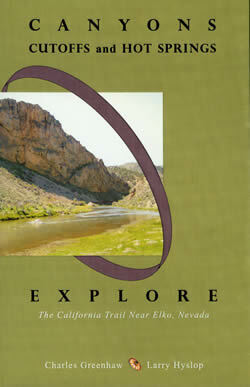 The trail meanders along a growing Humboldt River through the narrow confines of Carlin Canyon. 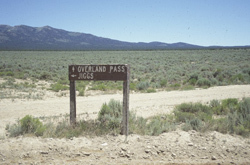 This book follows the end of the Hasting’s Cutoff from Overland Pass, having finally bypassed the Ruby Mountains, to finally emerge into the Humboldt River Valley. Along the way, historian Charles Greenhaw describes the Shoshone villages along Huntington Creek, fur trapper/explorer brigades crossing Secret Pass and the amazement of emigrants at the boiling water of Elko Hot Hole. Maps and route descriptions help historical time travelers visit sites along both the California Trail and Hastings Cutoff.